There is a book out there this Christmas called The Star Wars Vault. For any fan of Star Wars movies (I hear there's a few out there), this is the ultimate book. It covers the history, the hidden stories, the quirky facts, and is loaded with memorabilia (much of it removable) and two audio CDs. I'm not even a huge fan of Star Wars, but I thoroughly enjoyed flipping through this title. It is the must have Star Wars item for Christmas 2007. Why am I telling you this here at Hockey Book Reviews.com? Because I've found the hockey equivalent! 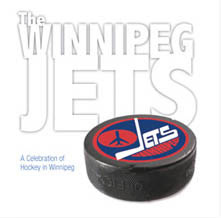 Studio Publications has produced The Winnipeg Jets - A Celebration Of Hockey In Winnipeg. I call it The Winnipeg Jets Vault. Everything and anything Jets is inside this HUGE and beautiful book. So huge that it is almost cumbersome, and so beautiful that any fan of the Jets or of WHA hockey or hockey in the 1980s will want this book on their coffee tables. I must say I am continually totally blown away by this book. It really is too bad that Studio Publications is a Manitoba based publishing house, because every team in pro sports deserves too have a book this good available for their fans. Amazing job! By the way, if you're looking for a book on Winnipeg's other extinct hockey team, check out Eric Zweig's Long Shot: How the Winnipeg Falcons won the first Olympic hockey gold .